Fingerprint recognition has been a proven method for personal identification in forensics for more than a century. During the last decade, it made its way to civil applications as well and has grabbed a signification market share in identity and access control applications. A number of fingerprint recognition systems have been deployed across the globe by the government as well as private outfits for a variety of applications. While fingerprint recognition systems are being deployed to address existing challenges, its new applications also continue to emerge. A significant portion of daily operations in many enterprises, businesses, data centers, law enforcement, governmental, and educational outfits depend heavily on smooth functioning of fingerprint recognition systems. This dependence requires fingerprint recognition systems to be robust enough to maintain high performance during round the clock operations with minimal errors like false rejections, false acceptances, etc. There are a number of factors that can affect performance of a fingerprint recognition system, however, quality imaging of the fingerprint features is the most important part that can affect overall performance of a biometric system. Fingerprint recognition has always been the most technologically benefitted method of identification among all other biometric recognition methods. It is also the most extensively used method in identification and authentication applications. Being inexpensive and easy to deploy, it can be effortlessly set up with a variety of applications without any expert knowledge. Now when fingerprint recognition is making its way to mobile phones, tablets and other portable devices, the numbers of biometrics fingerprint penetration are set to grow exponentially. A device making use of a fingerprint sensor does not limit to device locking – unlocking, app developers can leverage this piece of hardware to identify and authenticate users accessing various services. Even the high security applications like finance and banking are making use of fingerprint sensors on mobile devices. Many banks and financial service organizations have upgraded their mobile banking apps to leverage in-built fingerprint sensor to login to the app, access services and authenticate payments. Touching is one of the most natural activities to sense things and it is effortlessly done several times in a day. Presenting finger for a biometric scan also does not require anything extraordinary, just a natural touch is good enough. This level of convenience is not offered by other biometric methods of identification. This is also one of the reasons to the popularity of fingerprint identification. Why does fingerprint image quality matter? However, a fingerprint recognition system’s performance does not entirely depend on its recognition algorithm or technology used. Recognition algorithm only makes use of what is presented to it, i.e. the scanned biometric image. Poor quality fingerprint image will make it hard for recognition algorithm to identify and calculate available minutia that will affect overall performance of a biometric system. Fingerprint recognition algorithm does play a role in performance of a biometric system, but quality imaging of biometric features always remains a crucially important factor. Failing to capture good quality fingerprints images may not pose any immediate harm, however, later it can result in administrative burden, lengthy waiting period, lower confidence in fingerprint matches, etc. In extreme cases, it can even be life threatening or pose threat to the national security. Fingerprint is the pattern formed by friction ridges on the surface of a fingertip. A good quality fingerprint image has distinguishable patterns and features that allow the extraction of features that are useful for subsequent matching of fingerprint pairs. Fingerprint image quality can be influenced by several factors like environmental, behavioral, quality of biometrics presented, system ability, etc. Some of the factors, affecting the fingerprint image quality and eventually the matching performance, can be addressed at user end, for example, subject might have wet fingers rendering biometric system unable to scan, so drying up fingers prior to sample collection will enhance quality of captured image. Environmental factors like operating the equipment in extreme environmental conditions; scratched or smudged scanning surface, etc., can also be addressed at operator or user end. Factors like system’s ability to resolve details, efficiency of biometric algorithm, worn off fingerprints due to disease or age, etc. cannot be intervened by a user hence there’s nothing much that can be done at user end. Maintaining high level of performance in verifying conditions for all population groups is a major challenge in fingerprint recognition. There is one thing common in all the factors that influence fingerprint image quality is that they somehow affect the process of image capturing, let it be environmental, technical or the user behavior. Poor image capture further results in poor feature extractions and inadequately sampled biometric data. Even in manual capture of fingerprints, which has been a common application in law enforcement, a proper capture of fingerprints is an essential requirement. Captured digitally or manually, high quality image of fingerprint features can result in improved performance of automated biometric system as well as in manual matching. Electronic capture of fingerprints is not only more efficient but also produces high quality images than the manual process, however, image quality may still be hampered by certain conditions and factors. Operating the equipment in harsh environmental conditions like extreme heat, cold, light or humidity, beyond standard operating conditions. User behavior, like presenting moist, greasy or dirty fingers to scanner. The way fingertip is placed on the scanning surface and amount of pressure applied by the user can also affect the quality of scanned image. Equipment is not regularly maintained, dirty, smudged, or scratched scanning surface. If the user is suffering from disease affecting quality of friction ridges. Age is also a factor; fingerprint samples obtained from elderly population are mostly of inferior quality in comparison with a younger 18-25 year old population. Sensor type, technology and specifications of the acquisition device. Lack of training, users’ unfamiliarity with sample acquisition process or a device that does not facilitate easy and correct user interaction may result in highly variable acquisitions. Some of the factors and conditions mentioned above can be addressed by user/operator intervention and behavioral correction; however, there are certain factors beyond the scope of a user/operator, like age, permanent/long term medical condition, efficiently of recognition system, technology used, efficiency of recognition algorithm or any manufacturing defect. While manufacturing defects can be addressed by the vendor or manufacturer, factors like system or algorithm efficiently can only be addressed by R&D and approval of standardization authority and roll out of the enhancement. How fingerprint image quality can be improved? Importance of good quality fingerprint capture is often overlooked, while it can be achieved by putting little efforts by the user or operator. Law enforcement agencies like FBI often urges its employees about the importance of fingerprint image quality and how it can be achieved. The bureau also emphasizes a live scan over traditional ink-and-roll method of capturing fingerprints. Live scan or electronic capture of fingerprint is not only faster and efficient, but also produces clearer, sharper and high quality fingerprint images over ink-and-roll method. Controlling environmental conditions, user behavior and familiarizing users with acquisition process can make a difference in sampled fingerprint image quality, for example, rubbing dirty fingertips with alcohol or drying up wet fingers will result in improved quality of sampled data. The scanning surface should also be cleaned and scratch free. Equipment should be placed away from unnecessary disturbances or extreme environmental conditions. At technological end, biometric recognition system should also be able to put image quality checks in place and reject poorly scanned images. The recognition algorithm can be set to look for detail thresholds to accept or reject the sampled data and ask for re-sampling, however, this approach is only good for the enrollment process. In the forensic applications, this approach will cause more harm than good as samples collected from crime scene are often far from perfect. Fingerprint recognition system can analyse the intrinsic characteristics of sampled fingerprint image beforehand to determine its usability for further processing. Fetching a fingerprint match is dependent on several factors, however, fingerprint image quality plays a pivotal role in successful matching. Other sub-systems of a biometric system depend on the quality of acquisition by the data capture sub-system. 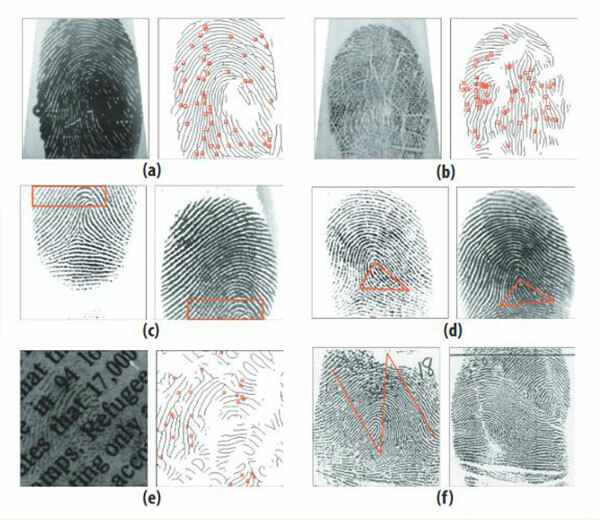 A poorly sampled fingerprint image not only hampers matching efficiency, but also results in poor performance by the overall system. Ensuring that sampled fingerprint image is of the highest possible quality is a crucial aspect, especially during the enrollment as subsequent matching operations post enrollment are compared against what is enrolled. If fingerprint data presented for enrollment is of inferior quality, the system may not let it enroll at all, resulting in Failure to Enroll (FTE). Even if inferior quality fingerprint data is enrolled, there will be higher number of false non-match cases post enrollment, posing system as inefficient. If enrolled sample is of high quality and during the verification process, probe is also of high quality then it will give high comparison scores, but when high quality enrolled sample and a low quality probe is compared it is likely to yield a low comparison score, hence it is hard to assign high quality and low quality appropriately when it is not known beforehand which sample the comparison will be made with. Therefore high quality capture of fingerprints is important for both enrollment as well as verification process. 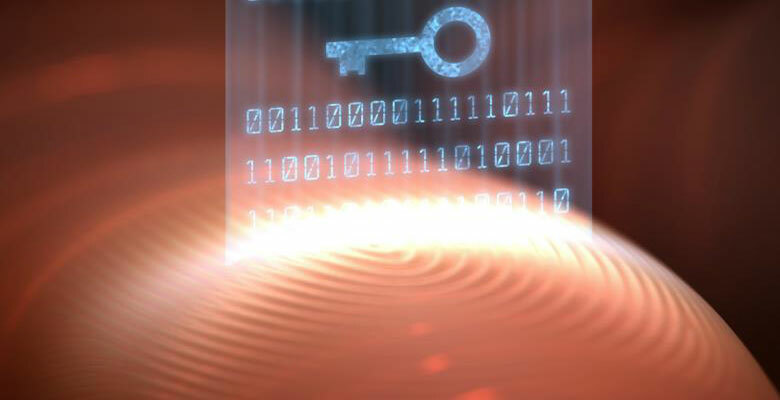 Fingerprint identification systems are very sensitive to the noise or to the quality degradation, since the algorithms’ performance in terms of feature extraction and matching generally relies on the quality of fingerprint images. Technological advancement can always assist with keeping image quality at acceptable level. Early recognition system were more sensitive to environmental and other factors, however, new biometric fingerprint recognition systems come with improved fingerprint sensors, which have more tolerance against environmental and behavioral factors. Newer sensors are constructed in such a way that they are resistant to even high amounts of moisture on the sensing surface without compromising the fingerprint image quality.